Map courtesy of Columbia Gas Transmission LLC. 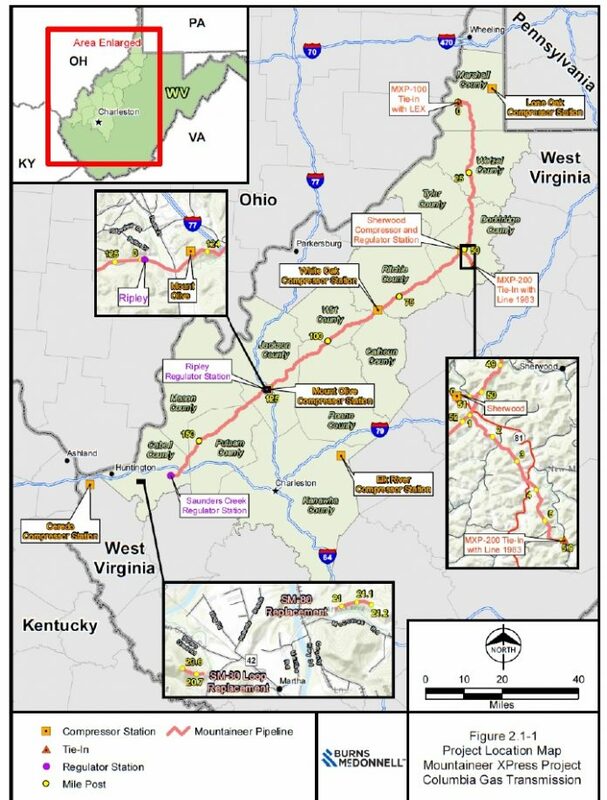 The US Federal Energy Regulatory Commission (FERC) has issued a favorable Environmental Impact Statement (EIS) for the Mountaineer XPress Project (MXP), a Columbia Gas Transmission LLC (Columbia Gas) project. Columbia Gas requested authorization to construct and operate a natural gas transmission pipeline and ancillary facilities in West Virginia, USA, and to modify one existing compressor station and two approved/pending compressor stations. If approved, the MPX line would provide takeaway capacity in the Marcellus and Utica shale gas production areas of West Virginia. The line includes 165 miles (266 km) of new pipeline and three compressor stations. Columbia Gas plans to put the project into service by November 2018. According to Columbia Gas, the primary purpose of the MXP is to provide up to 2.7 million dekatherms per day of firm transportation service from receipt points in the Appalachian Basin to markets in the Midwest, Northeast, Mid-Atlantic, South, and Gulf Coast. The MXP would transport natural gas from receipt points in the towns of Oak Grove, Majorsville, Goodwin, Sherwood, and Stonewall, West Virginia, and Clarington, Ohio; and Waynesburg, Pennsylvania, to markets on the system. Sherwood Compressor and Regulator Station: This new compressor station would consist of four natural gas-fired compressor units totaling 47,000 hp (35,062 kW). The station would also include three pig launcher/receivers and pressure regulation for interconnections with the MXP-100 and MXP-200 pipelines. Additionally, Columbia Gas proposes to connect at this facility with a planned non-jurisdictional pipeline to be constructed, owned, and operated by MarkWest. White Oak Compressor Station: This new compressor station would include two natural gas-fired compressor units totaling 44,800 hp (33,420 kW). It also would include two pig launcher/receivers. Mount Olive Compressor Station: This new compressor station would include three natural gas-fired compressor units totaling 61,500 hp (45,879 kW). It also would include two pig launcher/receivers. Lone Oak Compressor Station: Columba Gas proposes adding one 15,900-hp (11,861-kW) natural gas-fired compressor unit and other related equipment to its Lone Oak Compressor Station in Marshall County, West Virginia. Ceredo Compressor Station: Columbia Gas is proposing to add two compressor units, one 30,000 hp (22,380 kW) natural gas-fired unit and one 13,000 hp (9698 kW) electric motor-driven unit and other related equipment at its existing Ceredo Compressor Station in Wayne County, West Virginia. Elk River Compressor Station: Columbia Gas would add one 15,900 hp (11,861 kW) gas-fired compressor unit and other related equipment to its pending Elk River Compressor Station in Kanawha County, West Virginia. Editor’s note: Receiving the EIS is the final step before FERC decides whether to approve the project or not. As of press time, FERC lacks the quorum necessary to approve projects, which means these projects will not be up for approval until new members join the regulatory body. (See April 2017 Gas Compression Magazine, “My Kingdom For A Quorum”, p. 46).